During June, 1998 the northern Victorian town of Kerang, where I live, suffered a succession of severe frosts, which resulted in the loss of most cymbidium flower spikes and the death of many small plants. Although my cymbidium house has shade-cloth walls and a fibre-glass roof, partly overhung by a large Melaleuca tree that provides some measure of frost protection, the temperature at bench height still fell to -5°C on the coldest night. Even in the centre of this house all of my cymbidium spikes were destroyed. 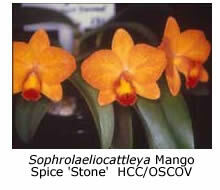 However, on the same bench many cattleya, laelia and sophronitis species and their hybrids were largely unaffected. 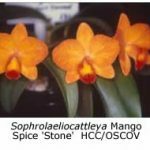 Those orchids that appear to be unharmed by the frosts are listed below as a guide to other growers whose orchid houses are also prone to occasional severe frosts. Sophronitis coccinea, a cool-growing Brazilian species with shapely red flowers. Cattleya loddigesii, a bifoliate cattleya species with light lavender flowers. Cattleya intermedia. Four cultivars, namely ‘Amethystina’, ‘lrrorata’, ‘Alba’ and var. flamea. Laelia gouldiana, a Mexican species with lavender flowers. Laelia anceps, another Mexican species with pink or white flowers. Laelia pumila, a Brazilian species with small, pink or mauve flowers. Laelia milleri, another Brazilian species with small, brilliant red flowers. Laelia purpurata, also from Brazil, with large, spectacular purple and white flowers. Laelia xanthina, a rock-growing Brazilian miniature species with small cream or yellow flowers. Many other species survived the frosts but showed various degrees of leaf burn. 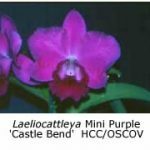 Those cattleya hybrids that survived unscathed are listed below; many have the cold-tolerant Sophronitis coccinea as a parent. Sophrolaeliocattleya (Slc.) Dixie Jewels ‘Suzuki’, a red-flowering miniature cattleya. Slc. Hazel Boyd, several cultivars of this popular, easily flowered grex. Sophrocattleya (Sc.) Batemaniana ‘ Hawaii’, a splash-petal hybrid between two cold-tolerant species, namely, Sophronitis coccinea and Cattleya intermedia. Sophrolaelia (Sl.) Orpetti x Laelia flava. SI. Orpetti is a hybrid between the cold-tolerant species Sophronitis coccinea and Laelia pumila, while Laelia flava is also cold-tolerant. Laeliocattleya (Lc.) Mini Purple ‘Tamami’ (L. pumila x C. walkeriana); the latter species needs a little warmth. Lc. Angel Heart x Sc. Batemaniana. Several cultivars of the first-named parent shed their leaves as the result of the frost. Most large-flowered, monofoliate cattleya hybrids do not tolerate any level of frost, their pseudobulbs freezing and turning to mush, the only exception in my experience being Brassolaeliocattleya Malworth ‘Orchid Glade’. 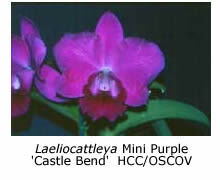 However, the above lists show that there are many species and hybrids of the cattleya alliance that can be grown in inland areas where severe winter frosts are frequent occurrences.